The child safety tips section covers a wide variety of areas and is important for anyone considering starting a home daycare. Each area is important to the safety of small children. Do not take this section lightly, assuming you are very careful and will always have an eye on the children. Small children can move fast and get into things in the blink of an eye. Your home environment is probably not as safe as you might think. Don’t believe me? I’m going to take a guess that most of you reading this right now are using a laptop. Is it plugged in? Really…. take notice of where the computer cords are. If you are like most people, the cords and the outlet they are attached to are in plain sight. Which means they will be easily seen and played with by a small child. 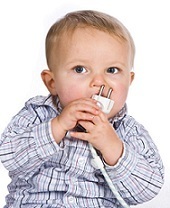 All homes with small children should have outlet covers in all unused outlets. Use the box type outlet covers to protect the ones that are in use from curious children. The very best way to child proof your home is to literally crawl through your home like a small child would. You will feel silly and will probably also look silly doing so, but you will see exactly what a small child would see. I do know, however, that the grand majority of you won’t actually crawl around, so I’ll give you an idea of other areas where child-proofing may be needed. Anything sitting underneath a table or bed? What about items in drawers low enough for small children? Items found in these areas will become play things if not removed and put away in a higher location. Anything in lower cabinets? Many people keep their cleaning supplies under the kitchen sink or they keep hazardous bathroom items in a low cabinet. All of these items are at the perfect height for children to explore. The number one child safety tip? All hazardous items need to be locked up in a location too high for children to easily reach. All cabinets should have cabinet locks. These are low cost items and easy to install. Start by using the free printable home safety checklist. This child safety tips checklist has been designed for you to carry with you as you as you go about your home making every room safe. While each individual home may have more or less hazards than another, this list gives you the basics of what to look for. Many ordinary household items are dangerous for children. Check out my list of potentially dangerous items for hidden dangers you may have in your home. Many are items you may not suspect of being potentially dangerous for children. There are daycare safety regulations on sources of water along with hot surfaces, stairways, decks, locks, remodeling, electrical and sanitation issues. Make sure you are in compliance with your county/state regulations. I've also got some extra child safety tips specifically for child care providers who are just setting up their homes. Take some precautions when getting your daycare set up and you may be able to prevent some of the most common accidents in daycare. Do you own a gun? Any chance the children in your care are exposed to guns in their own home, or the homes of relatives or friends? Read the special section on child gun safety. You may be saving a life. Do you have any toxic substances? Of course you do. You may even have items you didn't realize were poisonous. Go to home chemical safety for a list of common household toxins and some tips to help prevent poisonings. You should also be aware of plants that pose a threat to young children. There are many common plants that are poisonous. Find out which plants could pose a problem and tips for teaching children about plants. Child safety tips also covers the basics of storm and fire safety. Every home daycare is required to have a plan of action should a storm or fire occur. Go to my section on daycare storm and fire safety to find out what is expected of you. Last, but not least, although you (and I) hope you'll never need my tips, you should be prepared in the event of a daycare emergency. I've got some ideas to make sure you are as ready as possible. As you can see, there is much to consider when setting out to make your home daycare a safe environment. Look over all the child safety tips in this section and apply them to your own daycare. Once you have covered all the safety issues, and open your doors for business, do not consider the job done. Continue to monitor your home for safety. Looking for Forms? The DAYCARE FORMS area has an organized list of free forms available for immediate printing.